Taking on the JioPhone, Airtel's Karbonn A40 Indian and BSNL's Bharat 1, Vodafone has announced the Bharat 2 Ultra with bundled 4G services. The Bharat 2 Ultra will be available starting November. Vodafone and Micromax have joined forces to launch a low-cost 4G smartphone with bundled services at an effective price of Rs 999. The Bharat 2 Ultra 4G smartphone from Micromax will be made available to new and existing Vodafone customers starting November. The device is priced at Rs 2,899, the same as Airtel's Karbonn A40 Indian, but Vodafone hopes to attract customers with its cashback offer on the 4G smartphone which brings its cost effectively down to Rs 999. 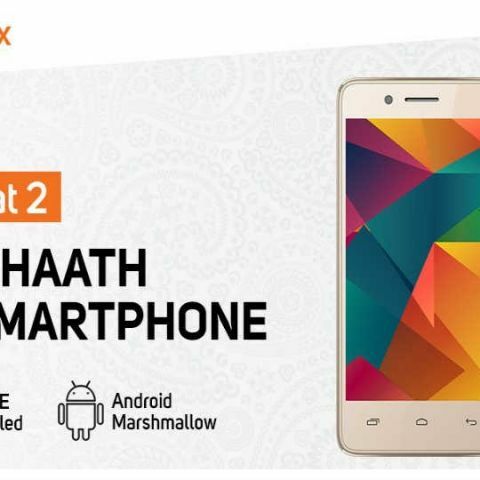 The Bharat 2 Ultra from Micromax is a new smartphone in the domestic mobile maker’s 'Bharat' series of devices. The company had recently announced a 4G feature phone, the Bharat 1, in partnership with state-run telecom operator BSNL. The Vodafone-Micromax collaboration will make it possible for customers to purchase the Bharat 2 Ultra at Rs 2,899. Customers will then need to recharge their Vodafone numbers with a minimum of Rs 150 per month for 36 months. Recharges can be of any denomination totaling to a minimum of Rs 150 per month. At the end of 18 months, users will receive a cashback of Rs 900, and after another 18 months, another cashback of Rs 1,000, in their Vodafone M-Pesa wallets. This will enable customers to transact digitally or withdraw cash. Interestingly, Vodafone has not announced any data or calling benefits with the Rs 150 recharge. "We are delighted to partner with Micromax to democratize the 4G smart phones at a never before price of under Rs 999. This will help fulfill the aspirations of several million phone users across the country who desire a smart phone but couldn't afford one. It will also encourage current non users of 4G to upgrade and enjoy a richer user experience with Vodafone SuperNet 4G," said Avneesh Khosla, Associate Director - Consumer Business, Vodafone India. The Bharat 2 Ultra is powered by Spreadtrum SC9832 1.3Ghz Quad Core processor with 512MB RAM, 4GB ROM. It sports a 4-inch WVGA display and has a 2MP rear camera, a 0.3MP front camera. The device also comes with different camera modes like scene, frame and burst. The handset runs on Android Marshmallow and has a 1300 mAh battery. “It supports full video viewing, social networking and chat apps to give a complete smartphone experience to users,” says Vodafone. As per Micromax, the Bharat series of smartphones has already been adopted by 2 million users. Commenting on the partnership with Vodafone, Micromax Co-Founder, Rahul Sharma said, “The Bharat-Series, has been aimed for acquisition of the first generation smartphone users. This partnership with Vodafone will help bring in the next phase of smartphone adoption by hand-holding consumers to upgrade them from feature phones to smartphones. We believe that greater device affordability and low cost data packs will drive increased smartphone adoption, as there is still a huge gap. At Micromax we want to give superior device experience in an affordable way and Bharat range is a testimony of the same, having already sold more than 2 million handsets." The Vodafone-Micromax Bharat 2 Ultra is now competing with Airtel’s Karbonn A40 Indian, BSNL’s Micromax Bharat 1 and the Reliance JioPhone. The Reliance JioPhone is “effectively free” as the company is offering the device at Rs 1,500, which will be refunded in full once a buyer returns the device after three mandatory years of usage. The BSNL-Micromax Bharat 1 is priced at Rs 2,200 and unlike the JioPhone, it has unlocked SIM slots which means that users can switch between their choice of network providers. Airtel’s Karbonn A40 Indian is priced at Rs 1,399 effectively, against its actual price of Rs 2,899. It comes bundled with a Rs 169 monthly recharge plan by Airtel.